Flattus Maximus of GWAR teaches his parts to "War Is All We Know" from their Beyond Hell record. Love it. Awesome chord progressions and licks. Don't listen to the detractors, Flattus... you don't need me to tell you that. I had fun watching and it'll be quite a while until I can be anywhere near this capable. Thass...ummm...one well fed guitar stokin' demon. Flattus may wanna think about drinking lite beer from now on. Oh well, as they tend to say, Rock On!! Put your soul on the chopping block with lessons from Gwar's Flattus Maximus (Cory Smoot), a gassy disaster whom slaughters thousands with his shredding solos and reeking flatulence. Flattus Maximus of GWAR teaches his parts to "Womb With A View" from the War Party record. Flattus Maximus of GWAR teaches his parts to "Bring Back The Bomb" from the War Party record. Flattus teaches this song from the Beyond Hell record. About Flattus Maximus View Full Biography Flattus Maximus (Cory Smoot) was the guitarist for the heavy metal band Gwar. Tragically, on November 3rd, 2011...Cory passed away due to a heart condition. 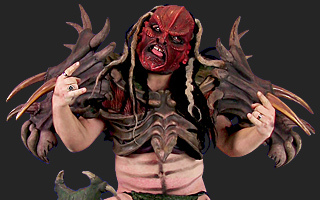 He was an absolute pleasure to work with as a part of GWAR. It was an honor and a pleasure to know and hang out with him out of costume as Cory Smoot. RIP buddy. You'll be continued to be loved and missed. Cory was known by his red face, white dreadlocks, dinosaur-head shoulder pads and reptile feet. The name "Flattus" implies (verified by various concerts) a flatulent character. His speaking mannerisms suggest a childlike intelligence and naivety (until recently; his entries in the current website's blog depict a different, more violent Flattus). Cory's lessons are taught in full costume. He teaches 4 Gwar songs. Beware..this guy has a ferocious right hand so make sure you have your metal chops up to par before attempting his lessons.